– Fred brought Jordan Schur, touring manager of the band at the time, out on stage to sing ‘My Way’ with him. – The band jammed ‘Sweet Child ‘O Mine’ by Guns ‘N’ Roses until the first chorus after ‘My Way’. – The Blackout, opening act of the show, joined the band for ‘Counterfeit’. The story behind this is that The Blackout asked the band if it was possible that the band played the song during soundcheck. Fred suggested that they join him for the song as it was the first song that The Blackout ever covered. Sean from The Blackout later called this “their ultimate fanboy moment”. 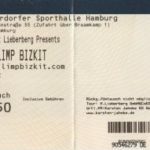 – Two fans were invited on stage for ‘Nookie’, with one of them being the guy who joined the band on stage at Rock Am Ring 2009 and did vocals at the end of ‘Full Nelson’. During the middle of the song, he got very close to Wes and Wes let him know that he did not like it. Afterwards, Wes tweeted: “I pushed that guy. I didn’t hit him. He was being very aggressive.” After that, both fans were dragged off stage.